Sarjit takes us to the Kultar's Mime theatre performance held on Sunday in Kuala Lumpur. Based on a poem written by Sarbpreet Singh in 1990 and premised on the Delhi violence of 1984; audience were taken through paintings followed by the play and finally the Q&A session. The powerful and universal message conveyed is - to protest and stop acts of violence all over the world. We watched in awe, the final leg of Kultar’s Mime theatre performance at the Temple of Fine Arts, Kuala Lumpur on Sunday. The cast had made their rounds in 5 cities: Malacca, Johor Bahru, Petaling Jaya, Ipoh and Penang. The five performers – Cassandra, Rose, Sydney, Ben and Ross – with a background in theatre and creative arts, performed brilliantly! It was the team’s performance no 71. The script was based on a poem written by Sarbpreet Singh in 1990, premised on the Delhi violence of 1984. Boston-based writer Sarbpreet is the co-director and nucleus behind this empowering enactment of history. His poem entitled Kultar’s Mime is named after a character he read and was intrigued about, on the survivors in Delhi. His daughter, J. Mehr Kaur, decided to adapt his poem into a play. An accomplished theatre director who is completing her degree in arts and theatre; she directed and brought her dad’s poem to life. It was written in their destiny. The rest, as they say, is history. Kultar’s Mime blends painting, poetry, theatre and music to tell the stories of Sikhs who survived the Delhi massacre in the wake of Prime Minister Indira Gandhi’s assassination. In retaliation to her demise, an organised series of murder and arson was unleashed upon Sikh residents of Delhi and other parts of northern India. It is estimated that more than 3,000 people lost their lives. The exact numbers are not known as there is very little documentation found on this genocide. The Sikhs suffered, with those economically marginalised taking the brunt. The cast play both the roles of perpetrators and victims. In a way, they assume upon themselves both the responsibilities and dispositions of both characters. Using a variety of actions and symbol, the play depicts various incidents of the anti-Sikh massacres – the killing of Kultar’s father as Kultar looks on, riotous mobs assaulting and setting people on fire using gasoline. Plotters urging rioters on – with petty rewards propelling them. The play is part of a larger narrative on how 1984 is remembered and memorialised. There were 3 parts to the play. We were first introduced to the paintings on stage, akin to a simulated art exhibition, for our interpretation. 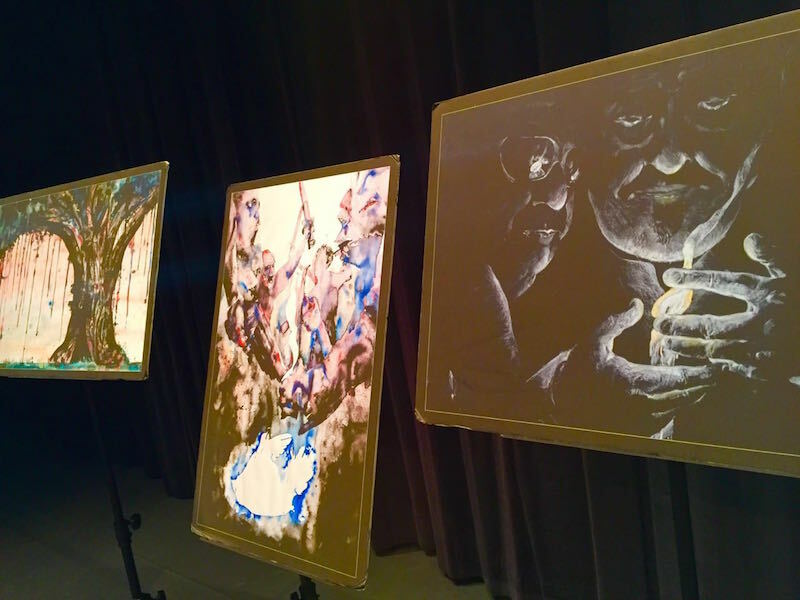 The paintings form the sole and fundamental prop for the show. They had a dark theme to it. In viewing them, the audience comes face to face with untold and inexpressible horrors. How do you speak of unspeakable experiences? How do you convey experiences that defy language? We were then brought into the play intertwined with melancholy music. And finally the Q&A session which proved so relevant for our key takeaways. While the play depicts strong violence, it does not dissolve into despair. It ends with a note of hope. Through the passage of time, darkness will disappear and the space of time will ‘right’ the ‘evil’ as echoed by the final poem. Into a million blazing suns shattered will be the night. The question and answer session which succeeded the play, led by Sarbpreet Singh and Coalition of Malaysian Sikh Organisations (CMSO) secretary-general Autar Singh, was useful and relevant to help think thru pertinent issues, moving forward. Dr Surinder Kaur [Universiti Malaya] did an excellent job in facilitating and complementing the interview with much passion and dedication. Essentially, the key takeaways are summarised here in a question and answer format. Question 1: Why was the play entitled Kultar Mime? Answer: Among others, it’s about a little Sikh boy by the name of Kultar who is deaf and mute, who witnessed the violent killing of his dad at the hand of rioters. Because he doesn’t have a voice, Kultar mimes his actions and enacts some gruesome scenes the day his father was killed. It was heartbreaking to see this little boy go through such pain, at a tender age in his life. Q2: Why was Kultar’s Mime brought to Malaysia by the Malaysian Young Sikh Leaders Initiative (MYSLI), a wing of the CMSO? A: The Coalition brings any subject matter relating to Sikhs which will be of interest to the community. Besides showcasing the history and culture of the Sikhs, the objective is also to promote performing arts to our youth as a career option. On the sidelines, Sarbpreet also conducted theatre workshops for children and youths to condition them on the field of performing arts. According to him, the scripts are ready to be rehearsed. His dream would be to see them being localised by our local talent. And he is ready to assist in this regional collaboration. Q3: Like many, I wondered why Kultar’s Mime did not have a Sikh cast considering it’s a story on Sikhs. A: A wise friend remarked that with a cast of Americans, it becomes more persuasive to promote the play globally, considering the widespread message it carries to stop all forms of violence. The sufferings of innocent victims then becomes a universal cause, and not related to any one particular race. Secondly, during the interview, we saw two of the young cast in tears as Sarbpreet narrated his journey. It touched our hearts – as audience. When people of a different race can feel your pain and loss, then you know that humanity is very much alive! Q4: How was the cast familiarised on the Sikh background before playing their part? A: The cast were taken through an education process of the Sikh culture, history and political situation in India, before they embarked on the play. They also visited Delhi where they had a chance to speak to the families of the victims. They were informed of the facts and through communication with the victims, were in a way emotionally connected to the subject matter to ‘feel’ and act the story. The passion and spirit they exuded during the play was testimony! Q5: Has the Government done anything to curb this issue? A: The leadership hasn’t changed much in the last 32 years. However, there has been increasing education and awareness on the issue. Generally, there is concurrence especially among the younger generation that the 1984 massacre was not acceptable. Q6: How has Kultar’s Mime help connect to the audience? A: Rose, one of the cast, related how one Canadian audience moved by the play, had come forward to thank her after the show. Her sister was one of those affected by the massacre. By watching this play, it provided an outlet to channel and let go of our fears, anger, pain and sorrow which has been trapped for too long inside. Through this trigger, our negative emotions are released and we slowly heal in the process. Another audience who was there during the massacre in India, felt emotionally evoked during the play, not realising that there are still remnants of emotions present and not cleared, which inevitably and subconsciously tends to direct the way we see and lead our lives. Q7: What was the fate of survivors in refugee camps? A: Tilak Vihar also known as the ‘widows colony’ is a refugee camp of survivors which still exist in West Delhi, filled with many children like Kultar. It has been 32 years, however the widows of Tilak Vihar still tear up each time they recall the horrors of the 1984 anti-Sikh riots. Unfortunately for the victims, they lived without their dads. Their mums worked hard to make ends meet. The young men never finished school and idled as their mothers worked. Their homes and surrounding were in dilapidated condition. It was part of the compensation awarded by the government to the widows who survived. As a result, the youth resorted to drugs and alcohol. Most young survivors grew up to become auto drivers. They then become parents who had children with similar unfavourable lifestyle. This pattern continued. It was sad to see their impoverished state of affairs. Sarbpreet couldn’t even begin to ask them questions on what they went through seeing the pain they still carry. It was so difficult. Q8: How did Sarbpreet feel when he was told that Kultar was alive and living in Delhi? A: He was happy, yet had anxieties on what the character of Kultar would turn out to be. Perhaps Sarbpreet’s poem on Kultar which was penned in 1990 kept Kultar’s spirit alive. We can never underestimate the positive energies that we radiate to the universe. Q9: Did Sarbpreet get to meet Kultar? A: Through the grace of the Guru, Sarbpreet met the defining character he was portraying to the audience globally. Kultar whose real name is Avtar, was a family man with a wife and two children. Sarbpreet managed to see him and saw this fine man in a turban. Sarbpreet was elated over what he saw. Kultar stood the test of time and was testimony that good will always prevail over bad. What an inspiration and bonus it was knowing that his Kultar’s Mime character had defied all odds and emerged a winner and stayed true to his identity. Q10: What do I like about the producers and play? A: Sarbpreet spoke with great strength, solitude and humility that you cannot help get connected to him and feel his journey and story. For him, the play is a tribute to innocent victims of violence all over the world. It draws attention and protests against the tragic cycle of meaningless violence that erupts till today. He has taken the noble path of walking the road less travelled. To spread this message to mankind. To stop the violence. As I watched the dark and disturbing scenes from the play, I felt that we cannot go on harbouring these negative emotions. Lo and behold, there was a positive twist to the story. That darkness will fade. That we must let go of sorrow, loss and fears of the past and move on. That we must not hold or carry the emotional burden with us anymore. That we must set ourselves free. We can choose to continue with the familiar lifestyle we have or to break the pattern that has affected our families and friends. The righteous path can never be wrong. Difficult and challenging – yes. But it’s worth every effort. We must right the wrong, as the poem echoes. Q11 : What has taken place, post the Play? A: As a result of the play, many of the audience have started researching on materials on the net. There is a strong desire to know more about the genocide and what actually happened, as it connects to our roots and identity. Among others, Sarbpreet suggested two movies to watch, namely Amu and Kala Rayan. May this burning desire and thirst for education and awareness continue. May we take a stand universally, to fight and stop violence. All forms of violence. We deserve a better place to live in. We deserve a better world to live in. A short synopsis on the two movies is provided herein. Amu is a 2005 film directed by Shonali Bose which was premiered at the Berlin and Toronto Film Festival. It is based on her own novel about a journey of a 21 year old Indian American woman who returns to India after graduation. There, she discovers the real India. She visits the slums and was struck by a feeling of dejavu and her past began to unveil. She meets Kabir, a college student who discovers that his father was instrumental in organizing the 1984 riots. She in turn, learns her birth name is Amu Singh and her Sikh father and younger brother were killed in the riots while her mother hanged herself in the refugee camp. They both struggled to find their true identity. Kala Taran is a 2004 Hindi movie directed by Sashi Kumar and set against the backdrop of 2002 Gujarat riots and 1984 anti-Sikh riots. It talks about a young Sikh woman, Amarjeet Kaur along with her son Jaggi who escaped the rioters and seek refuge in a convent with nuns. Preet, a young journalist meets Sister Agatha for a story and she rekindles an incident that took place back in 1984. The plot moves on where Preet makes peace with his troubled past and reclaim the outward symbol of his identity. Roti for the Soul is a compilation of heartwarming stories for the soul. Through her lens, Sarjit Kaur takes us on various journeys in life. Thank you, Sarjit for a succinct description of Kultar’s Mime and most importantly capturing the message put forth by Sardar Sarbpreet Singh which is the sufferings brought about by sectarian violence. I would like to record my appreciation and gratitude to Sardar Sarbpreet and his team for bringing this heartbreaking story to life. Please know that you have made a difference! You have given many so much to reflect on. I was one of the fortunate ones who was able to catch the last show in Malaysia. Watching the performance, not only did I feel immense outrage at what was happening before me, but a sense of great helplessness. For many of us, growing up in Malaysia and being so far removed from India, this play has brought about awareness of the horrors faced by our fellow Sikh brothers and sisters. Sectarian violence hasn’t stopped, so the stories of atrocities like those depicted in Kultar’s Mime must be retold, remembered and recorded in history. But, there must be more done to put an end to violence of any form!